Amouzou Bedi: The role of Why? | What? | How? in Knowledge for Development to unlock development complexity where development efforts are still having resistances. This blog proposes a conceptual approach that can used as a starting point to contextualize knowledge for development initiatives in international organizations and other types of non-profit organizations interested in knowledge for development to unlock development complexity in the areas where development efforts are still having resistance. Knowledge Producer, Knowledge customizer, Knowledge connector as well as Organizational knowledge leaders, development knowledge leader, knowledge managers and consultants involved in creating and implementing knowledge for development initiatives aimed at development process improvements in international development organizations context could benefit from the reflections and learning insights from this blog. The integration, the transfer and the alignment of available knowledge for development, strategies, concepts and methods into development processes and communities practices (client knowledge) is a pressing and challenging research issue today. This is required to change development policies, people’s mindset, development approaches, and capacity building of the local people to handle at a certain point their own problem and understand what issues lead to poverty as well as undertaking innovative research on specific development issues, developing key partnerships to expand knowledge exchange (e.g. academia, experts, civil societies etc. ), combining a global perspective with local knowledge, better interaction directly with clients to determine knowledge needs, helping countries address their own development challenges and match them with relevant global practices, disseminating good practice to different audiences, facilitating global partnerships and knowledge exchange, connecting, involving, drawing from existing research, data and expertise etc. Development researches and practitioners as well as Knowledge producer , Knowledge customizer, Knowledge connector in the areas of process and knowledge for development alike seek for solutions that aid the flexible alignment of knowledge for development efforts to development’s most value generating activities that enable the eradication for Extreme Poverty, and for promoting shared prosperity where development efforts are stilled mysterious. The advantages inherent in such efforts are variable. The execution of sustainable development processes is supported from a knowledge perspective, the economic, politic, the moral, cultural, social, public and environmental benefit of knowledge for development can be illustrated more easily and knowledge for development activities become "alive" because of it well integration in development processes - which in turn thrives sustainable development performance. 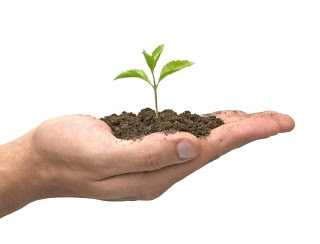 Development researches and practitioners have to work more with Knowledge producer, Knowledge customizer, Knowledge connector, partners to help identify why, what and how they can most effectively mobilize knowledge to influence social, economic, environment and change. They have to support local partners to identify and measure desired outcomes, understand the nature of local knowledge context, and the key people and organizations they need to be engaging with, and the Why? | What? | How? - and individuals (stakeholders, publics, private, government, civil societies and communities) are in any given context, and how they relate to each other and influence social and environmental challenge and change. Development practitioners as well as Knowledge producer, Knowledge customizer, Knowledge connector have to develop a strategy which identified approaches to understand the local context, the current knowledge on practices and preferences, to introduce new practical knowledge into communities’ practices, to support global partnerships, knowledge exchange , knowledge -sharing and learning for the eradication of extreme poverty, and for promoting shared prosperity. Effective development practices must recognize when the timing is appropriate to make investments in knowledge strategy (people, platforms and infrastructures) which identified approaches to support knowledge-sharing and learning to enable the development practices to deliver on its growth objectives. This practices should include declarative knowledge (e.g., basic development emergency solution routines and operating procedures), procedural knowledge (e.g., instructions from Development practitioners, Knowledge producer, Knowledge customizer, Knowledge connector, actual knowledge practice, and learning) and conditional knowledge (e.g., observation and development of a specific knowledge for development involving direct interactions with target communities) and others relevant knowledge exchanges and operation strategies. Development practitioners as well as Knowledge producer, Knowledge customizer, Knowledge connector should combine and apply the various knowledge types in development practice to assess comprehensively each local development’s condition and administer effective development solutions. Knowing the Why? | What? | How? to understand the current knowledge on practices, preferences and migrate into the future knowledge practices in complex regions that resist to development efforts (e.g. Africa) requires a more comprehensive understanding of the process of becoming knowledge focused, demand for evidence and how knowledge for development can understand and address the local situation, while taking advantage of investments in global and local knowledge for development strategy. Adopting a pragmatic bottom-up and top down approach- to develop research syntheses products, policy briefs and thematic guides, which present diverse perspectives on key development issues (e.g. undertaking innovative research on specific development issues, developing key partnerships to expand knowledge frontier (e.g. academia, experts, civil societies etc. ), combining a global perspective with local knowledge, better interaction directly with clients to determine knowledge needs, helping countries address their own development challenges and match them with relevant global practices, disseminating good practice to different audiences, facilitating global partnerships and knowledge exchange, connecting, involving drawing from existing research, data and expertise etc.). This bottom-up and top down approach explores the structure of an integrated knowledge for development strategy in international organizations and the dynamic interactions between local and global stakeholders to share research and knowledge about development using various repackage knowledge formats that are accessible to local community practices, policymakers and practitioners etc. It also demonstrates a description overview to classify and to deliver various knowledge for development´s products and to contextualize knowledge for development initiatives in international organizations. A good way to address a delivery structure and description - a record of exploration and delivering hierarchies that supports the translation of evidence into action. Providing access to research evidence is not enough to unlock the development complexity. Why? | What? | How? Despite abundant human capital, land, mineral resources cultural contributions and progresses to name a few things Africa remains poor. Getting a clear and deep sense of why and what (Demand of evidence) is happening there before the how (the translating of the acquired evidence into action/practice) may be the key to unlock Africa development complexity. If it is well done the Why? | What? | How? in knowledge for development can unlock the key to the mystery of development of the Africa. Knowledge for development have to undertake the right strategies to understand how people working at local and national development policy levels access and engage with the local evidence, local mentality, behaviors, culture, environment, information especially in the context of local sustainable development (the well-being of all). At the same time, it's important to understand the specific local practices we are concerned with. The practices endorsed by the geography, the culture, the history and others social, human and environmental factors. Understanding and listening to by knowledge producers, governments and donors etc. could help to well design, to produce, to package, to deliver and to support with elegance and simplicity a practical knowledge package for development into a foreign community practices. The crucial mission of Why? | What? | How? in Knowledge for Development is to help local community of practices, development policymakers, development practitioners, Knowledge producer, Knowledge customizer, Knowledge connector etc., to understand, identify and align trends and opportunities that guarantee and support the eradication of extreme poverty, and for promoting shared prosperity where development efforts are still having resistances. This step helps to listen and understand the local context, the situation, the challenge development practitioners are facing, and the need of adequate interventions or solutions. The why step allows development practitioners as well as Knowledge producer, Knowledge customizer, Knowledge connector to move from concrete observations of the happenings of a particular situation to the more abstract potential emotions and motives that are at play in the situation they are trying to listen, observe and understand. For example, why despite abundant human capital, land, mineral resources, cultural contributions, progresses, to name a few things Africa remains so poor? Why some are so rich and some are so poor? Why is the persons we are helping doing what they’re doing, and in the particular way that they are doing it? Why development efforts are sabotaged? Why are they so corrupted? A few many why questions, it depends. The advantage of this step is that it can reveal assumptions that development practitioners can early test with end beneficiaries to cover unexpected challenges and realizations in a particular intervention and investment. This step is a particularly powerful technique to leverage when analysing development intervention that development practitioners as well as Knowledge producer, Knowledge customizer, Knowledge connector have taken into the field, both for synthesis purposes, and to direct development issues and challenges to future areas of need finding. This step helps to design a solution and delivery strategy that result from the first step, the why step. For example what we need to do to help them help themselves? What to do to reduce the corruption? What to do to avoid social exclusion? What to do to avoid that those development efforts are not sabotaged? A few many what questions, it depends. The design and the delivery strategy should include these three parameters: 1. Inclusion Management in all phases of the intervention. 2. Sociocultural Infrastructures (Physical/soft) that enable the development and the support of the intervention. 3. 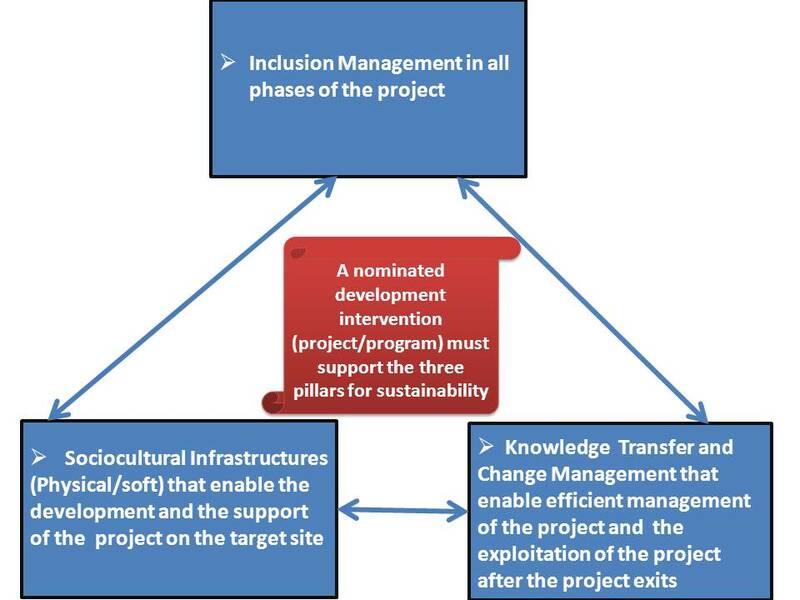 Knowledge transfer and Change Management that enable efficient management and the exploitation of the intervention on the target site after the intervention exits for maintaining sustainability. This is a particularly powerful technique to leverage the design of a solution and delivery strategy of a development intervention that development practitioners as well as Knowledge producer, Knowledge customizer, Knowledge connector have taken into the field, both for synthesis purposes, and to direct development issues and challenges to future areas of need finding for maintaining sustainability. This step helps to plan implementation of the solution, to develop and deliver, to measure and monitor, learn, train on the target site, that result from the second step, the what step. This step requires great design and social engineering talent. For example, how helping poor people to help themselves by the access to the right economic, social, public and cultural infrastructures and the related knowledge management and transfer that affect and endorse their daily lives and activities wherever they are living? How to secure local market for competitive advantage in production, consummation, and investment? How to develop local industries for job development? How promoting sector reform, improve governance, and the development of country-owned roadmaps? How assisting countries in developing sustainable financing strategies to implement large-scale programs? How to avoid the politicization of development arena to have more positive impact? How providing capacity-building support to both regional and national policymakers and service providers? A few many how questions, it depends. Development team (development practitioners, Knowledge producer, Knowledge customizer, Knowledge connector etc.) will challenge implantation solution and delivery intervention status quo by using right designs and prioritizing simple end beneficiaries needs and experiences to move an external knowledge solution into foreign community practices without destroy the available local knowledge and with the respect of the target environment. 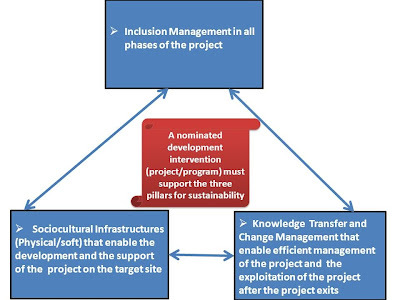 This step is a particularly powerful technique to leverage the implementation of the solution, to develop and deliver, to measure and monitor, learn, train on development intervention that development practitioners have taken into the field, both for synthesis purposes, and to direct development issues and challenges to future areas of need finding for maintaining intervention satisfaction and it sustainability into a foreign community practices. The “Why? ” is our reason for existing, the higher cause we believe in, and the big development problem/challenge we want to solve. I think that the Why? | What? | How? Model could help individuals, development practitioners, Knowledge producer, Knowledge customizer, and Knowledge connector to unlock development complexity, to better engage with policy and practice in an effort to be more productive and effective in reducing poverty, shared prosperity, improving human wellbeing and enhancing social justice in development regions that always resist to development efforts. This model is a master key that can be used everywhere while facing complex challenges or problems. *Author, Amouzou Bedi (Expertise and knowledge of the science management and its cultural implications in the developed and developing world in particular), contact on LinkedIn. I will try to update this paper on a regular basis if a need arises. Please if you have a suggestion (how we can better this framework) and feedback with regards to this work please feel free to share this. Many thanks for taking your time to read this paper.